A fast-read on the plays that matter. And options to consider. What plays did my friend or foe just run? What are the implications of these plays? How are third-parties (i.e., media, analysts and partners) speeding or slowing these plays? How will other rivals counter these plays? How will other allies accelerate or complement them? What are my options to bend, blunt, or flip these plays? Delivered weekly, Play Action Reports hone and expand your team’s competitive acumen with plays that are both inside and outside your comfort zone. It’s a forcing function to question convention and consider all possibilities. As well, it’s a friendly tutorial on the common lexicon of playcalling. 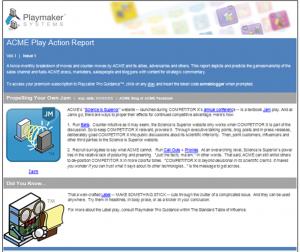 Play Action Reports typically contain two to four short-form summaries of relevant developments in your marketplace. Each item is linked to news sources and, of course, the precise play that describes the item. To ensure a competitive focus at work, reports are often read-out in weekly team meetings.